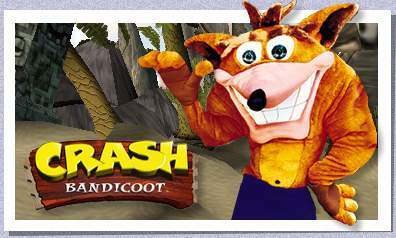 Before we begin the Crash Bandicoot tour, let's go over some ground rules. Rule #1 -- no pulling, touching or tugging on the costume. Rule #2 -- always obey Rule #1. This suits' a rental which means I've got to get it back to Australia in one piece or the Queensland Footballers will have my hide for defacing their mascot. Not to mention the fact that I'm looking to get back my $500 security deposit, which will go a long way to fixing the transmission on my truck. 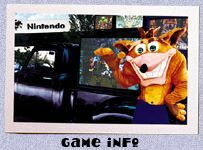 Now, if you'll step over to the truck you'll see that I've carefully assembled a bank of monitors demonstrating the raw intensity of my game Crash Bandicoot. Which reminds me of Rule #3 -- hands off the television sets. I didn't drive all the way to Nintendo(R) Headquarters in Seattle, Washington to humiliate the Plumber Boy, only to have some web site interloper mess with my tint control. Of course if you feel the need to get your grubby little hands on something you can check out the exclusive photos of the characters in Crash Bandicoot. 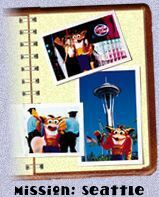 Or you can thumb through the photo album I've assembled which documents Operation Ram A Hairball In The Mustache Man's Pipe And Make Him Smoke It -- a name which proved to be too long and was thus shortened to Mission: Seattle. 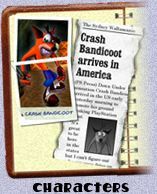 If you're feeling like you know enough about Crash you can do us all a favor and put on the accompanying mask (see Rule #48 regarding ugly people and the use of a web browser) then take in the Bandicoot Pursuit. You can check out the some of the selected film clips of actual Crash game footage which in light of its exciting action, mind-twisting surprises and cinematic realism, have earned two big yellow thumbs up. • What exactly is an Evolvo-Ray? No, it's not capable of turning your Mom's poodle into a Rottweiler whose last job was guarding Hell but it can give a Bandicoot a chance at a college scholarship. Dr. Neo Cortex uses his Evolvo-Ray to mutate native animals into a gang of super intelligent henchman. Koala Kong, Ripper Roo, and Pinstripe are just a few of the many mutant gangsters who attribute their success to Evolvo-Ray. Hey, Dr. Cortex, how do like your Evolvo Ray? "Thanks to Evolvo-Ray, I'm on my way to dominating the world."